Mansfield Museum and Art Gallery , in common with many other Museums, owes its beginning to the enthusiasm of a Victorian collector of natural history objects. William Edward Baily was born in Melton House, Mansfield and lived on Westgate, opposite the market Cross for many years. It was here he exhibited the beginnings of his collection, before moving to Cornwall , in 1882. The collection had by this time become so large that he decided he needed a special building in which to house it. He found what he needed in Battersea, London and in 1892 he moved a corrugated iron structure, that had been used for years as a Roman Catholic Church, to his home in the West Country. Three years later in 1895, he opened this building with its displays, to the public. Early in 1903, Baily wrote to Mansfield Town Council offering his collections as a nucleus for a museum for the town, together with a building in which to house them. His generous offer was accepted, together with the building, which was carefully reassembled on the former site of Sanderson’s foundry on Leeming Street . On 6th July 1904 the Baily Museum was officially opened by the Mayoress, Mrs J.E. Alcock. Thanking her, Alderman R. Barringer said that it was truly a ‘red letter day for Mansfield ‘ and that the Baily Museum would ‘educate, elevate and prove a blessing to all the inhabitants of the town who came within its walls’. Mr William Daws who had worked on the collections in Cornwall moved to Mansfield to continue his work and on retired in 1928. By 1919, the ‘Tin Tabernacle’, as it was affectionately known, was in need of regular and quite major repairs. The collections could no longer be housed safely and the problem grew with the acquisition of important new collections. In 1912 the Museum had received a collection of African natural history specimens assembled bythe late Captain Webb, who owned Newstead Abbey from 1860 until his death in 1899. He had spent two years big game hunting in Africa where he met the famous missionary and explorer, David Livingstone. In 1864, Livingstone stayed for some time at Newstead Abbey and, at Webb’s request gave a talk to Mansfield ‘s Mechanics Institute. The Public Library Committee was discussing the possibility of building a new museum but negotiations during 1919 for a site at Carr bank fell through. A gale in 1925 did considerable damage to both the buildings and the collections and it was becoming clear that something needed to be done. 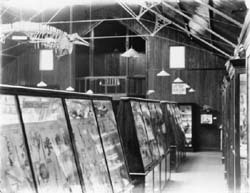 In the early 1930s two major collections were obtained by the Museum, making the need for a new building, even more acute. In 1932 the Town Council purchased the collection of local ‘naturalist’ Joseph Whitaker, who devoted well over half a century to the study of birds and eventually constructed a bird sanctuary on an acre of woodland behind his home at Rainworth Lodge. The rooms of the house were stacked ceiling high with glass display cases which contained his extensive collection of stuffed birds and animals. He had some 520 varieties of birds, mostly British, and 52 animals. In 1933 Mrs Buxton, the widow of Albert Sorby Buxton, loaned 127 of his watercolours to the Museum, intending to give them to the town when a new building had been built in which to house them safely. In November 1935 the condition of the building had become so bad that the Museum was closed and the building demolished. ‘……to display effectively the may valuable collections secured during the past 34 years, and to provide a series of special exhibitions on subjects of all kinds so that the regular visitor may be certain of new displays each month. In addition tot eh permanent collections loans will be obtained… bring before the people of Mansfield works of art and science that could not otherwise be seen outside our large cities’. The fourth gallery was not added until the mid 1960s and in 1989 the new ‘arcade’ extension, officially opened by H.R.H. the Duchess of York on 2nd May, brought the Museum out onto Leeming Street and gave it a more prominent position. The building we see today was completed in 1998 with the addition of a second story to provide state of the art storage facilities. The last major collection acquired by the Museum after the Buxton watercolours, was the fine collection of lusterware bequeathed by Miss Rachel Manners in 1967. Miss Manners began collecting lusterware at an early age and the collection comprised over three hundred pieces.